Our Abpromise guarantee covers the use of ab12498 in the following tested applications. IHC-P: 1/25 - 1/50. Perform heat mediated antigen retrieval with 10 mM citrate buffer, pH 6.0 before commencing with IHC staining protocol. We suggest an incubation period of 30 minutes at room temperature. Defects in AMACR are the cause of alpha-methylacyl-CoA racemase deficiency (AMACRD) [MIM:614307]. AMACRD results in elevated plasma concentrations of pristanic acid C27-bile-acid intermediates. It can be associated with polyneuropathy, retinitis pigmentosa, epilepsy. Defects in AMACR are the cause of congenital bile acid synthesis defect type 4 (CBAS4) [MIM:214950]; also known as cholestasis, intrahepatic, with defective conversion of trihydroxycoprostanic acid to cholic acid or trihydroxycoprostanic acid in bile. Clinical features include neonatal jaundice, intrahepatic cholestasis, bile duct deficiency and absence of cholic acid from bile. Belongs to the CaiB/BaiF CoA-transferase family. Immunohistochemical analysis of formalin-fixed, paraffin-embedded Human prostate carcinoma tissue, staining AMACR with ab12498. Staining was detected using DAB. ab12498 has not yet been referenced specifically in any publications. Publishing research using ab12498? Please let us know so that we can cite the reference in this datasheet. Folks, I have some questions about ab12498 that are not answered in the datasheet or the answers to the questions. 1. Is P504S the same exact sequence as AMACR as listed under HUGO/Genecards? 2.The antibody storage buffer is listed as sodium azide. Sodium azide is not a buffer. What is the composition of the storage buffer and what concentration is the antibody, eg is it 1 mg/ml IgG in PBS+0.05% sodium azide? Thanks for your help. Thank you for your enquiry. Rabbit polyclonal to AMACR (ab12498) is suspended in PBS, with 0.05% sodium azide and BSA. The concentration is 100 ug/ml. I hope this information helps, please do not hesitate to contact us if you need any more advice or information. Thank you for your enquiry. To address your questions: Please excuse my ignorance but according to the literature it seems that P504S and AMACR are interchangeable and synonyms of one another. From the details that I have I can tell you that this antibody was raised against full length P504S. I am in touch with the source of this antibody to determine the buffer components and the concentration of this antibody. I appreciate your patience in this matter. I will be in touch shortly. I am doing research using different anti AMACR antibodies as prostate cancer markers. 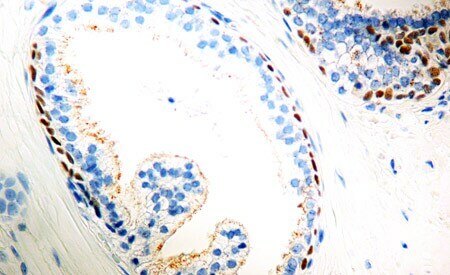 I would like some technical information about your product, ab12498, a rabbit polyclonal anti-AMACR antibody. In your datasheet, you mention that this antibody is raised against a synthetic peptide. I would like to know more detail about this synthetic peptide: what is the peptide? If you cannot tell me such detail, would you at least tell me what region of the AMACR protein does this synthetic peptide matches? Thank you very much! Thank you for your email. The immunogen used is a recombinant protein encoding full length P504S. If you have any further questions, please contact us again. Customer would like to know more details regarding the immunogen. Is the immunogen sequence available? If not, is the peptide sequence from the C- or N- terminal ends of AMACR ? The immunogen used is a recombinant protein encoding full length P504S. If you have any further questions, please contact us again.